As some of you may know, I recently went to Japan for two weeks. This has been a dream of mine since my freshman year of college. In no way was I disappointed. The people were kind and patient with my stumbling Japanese, the food was good (if sometimes weird), and the land incredibly gorgeous. Below are a select few pictures that I took while there, put here purely for your enjoyment. This is a picture of me and a professional potter. 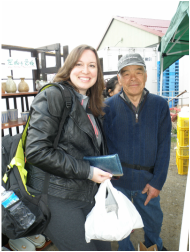 If you ever go to Japan, I suggest going out into the countryside and attending one of their farmer’s markets. You can find the most amazing things there! I bought a hand-made bowl from this man that looks gorgeous for the American equivalent of $25 dollars. Granted, he knocked the price down a little for me because he liked the fact I loved the bowl even though I’m a complete gaijin. But still, I bought a pottery bowl worth hundreds of dollars for $25! Farmers markets are the only way to shop over there. 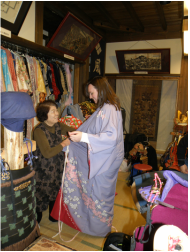 Yes, believe it or not, they DO make a few kimonos my size. I certainly didn’t expect that. (I’m 5’10” for those of you that don’t know.) The lady there only had one that would fit, but at least I got to play traditional lady for a little while!